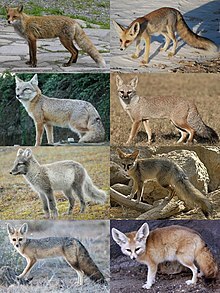 Various true tods: reid tod, Rüppell's tod, corsac tod, Bengal tod, arctic tod, Blanford's tod, cape tod an fennec tod. Vulpes is a genus o the Canidae. This page wis last eeditit on 11 August 2016, at 16:33.